We all know how popular adventure sport and off-road style motorcycles have become. But what if you want to take more passengers or luggage than a motorbike can manage? Whether it’s for a round-the-world expedition or picking up the weekly shop? Well, now you can go trials style, with the new Watsonian International Sidecar. The prototype version pictured will be close to the final release. 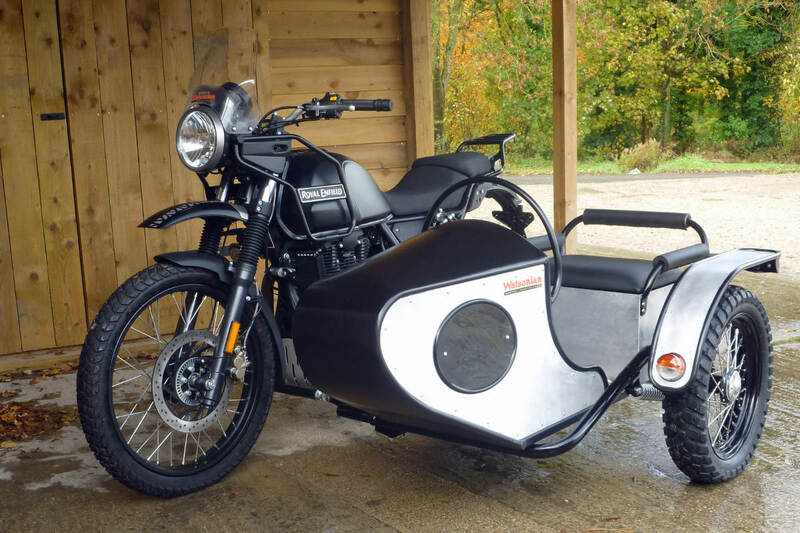 It’s shown fitted to the Royal Enfield Himalayan, and Watsonian have also been hard at work creating a universal fitting kit for their current sidecars for the Enfield. Although it’s got off-road trials style, the new Watsonian International sidecar has been created primarily to use on the roads. As a result, it’s got a glass fibre body to be durable and easy to maintain. But it does have aluminium panels to echo the style of the original International, which was around in the 1940s and 1950s. And there’s an aluminium mudguard holding the indicator and brake light. There’s the off-road bench seat, under which you get your spacious luggage locker. And the the black metal rim for passengers to grab to keep them stable. Underneath the new Watsonian International sidecar is the tubular steel platform chassis Watsonian have been using for a long time, with elded joints and epoxy power coating. To keep things comfortable there’s hydraulic suspension with a rising rate spring. And the sidecar is mounted on a 16″ stainless spoked wheel with a black powder coated steel rim and a Bridgestone Trail Wing dual sport tyre. The new Watsonian International Sidecar will be available in Spring 2019 and will cost £3,995 including VAT. The Royal Enfield Himalayan Watsonian fitting kit costs £450. 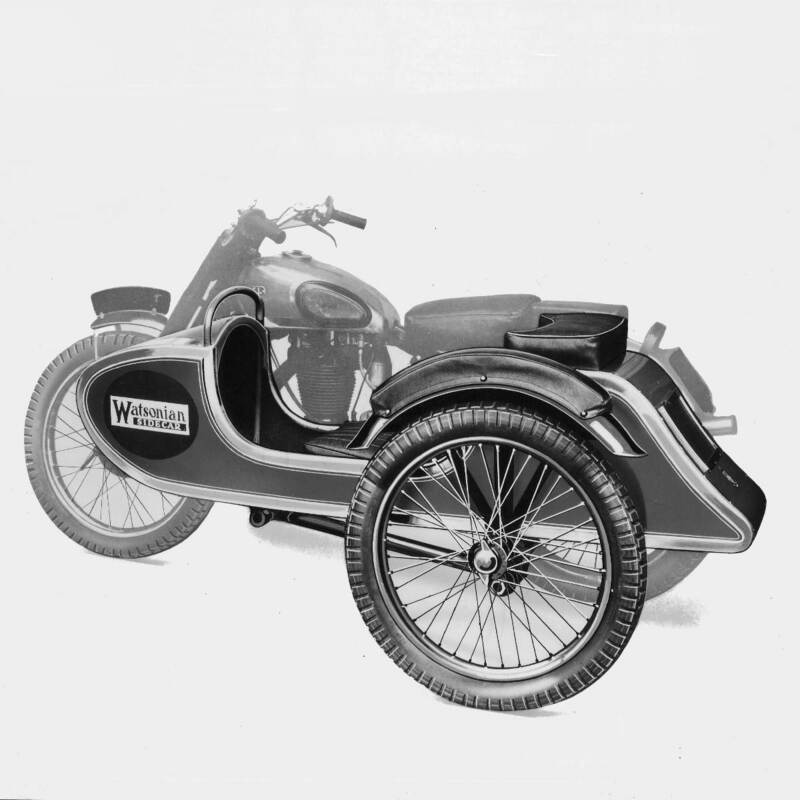 Inspiration for the trials and off-road style of the new Watsonian International sidecar actually comes from the firm’s original creation launched in 1938. The first International featured a lightweight all-aluminium body. But production was interrupted due to the outbreak of the Second World War. So it didn’t actually become available to buy until 1950. But when the original aluminium Watsonian International did reappear in 1950, it competed in the International Six Days Trail at Llandrindod Wells. And was regularly used by the company management team of Ron Watson and Cliff Bennett in a variety of trials events during the early 1950s. You can certainly see echoes of the original outfit in the new Watsonian International sidecar. And while it might not be suitable for off-road competition, it should be rugged enough to cope with whatever adventure you might fancy on the roads.